Growing up in Terengganu, on the east coast of Peninsular Malaysia, back in the mid-80s, my first introduction to Kuda Kepang, a traditional Javanese “braided hobbyhorse” dance, was probably through a catchy song entitled “Kuda Kepang” by a popular child singing duo at the time, Anuar (nowadays better known as Anuar Zain) & Ellina. Truth be told though, as a kid, I hardly paid any attention to the lyrics. Didn’t notice the part where Ellina sings “Kali pertama nonton boleh berpeluh, Melihatkan penunggang menghempas diri” (What a chilling sight for a new spectator, To see the riders writhing with vigour) or even if I did, I just didn’t know what it’s supposed to mean. It was enough for me to know some of the lines to just hum to the song whenever it came on TV or radio. I was more interested in the dance itself, as the duo was usually accompanied by a troupe who would dance around the stage with their braided hobbyhorses – something totally different from my own Malay culture in the east coast. Fast forward to some 30 years later, I’ve managed to watch several live performances of Kuda Kepang at some events and festivals, and I’ve also come to learn about the mystical side of it – which is not usually shown/ performed in public events like festivals, as those are normally the toned down version of the traditional dance. An opportunity to watch the “real” version of Kuda Kepang dance, however, came about recently when I joined ‘Rentak Selangor 2’ programme to learn more about the traditional cultures and dances of the locals in Selangor, Malaysia’s most industrialised state. 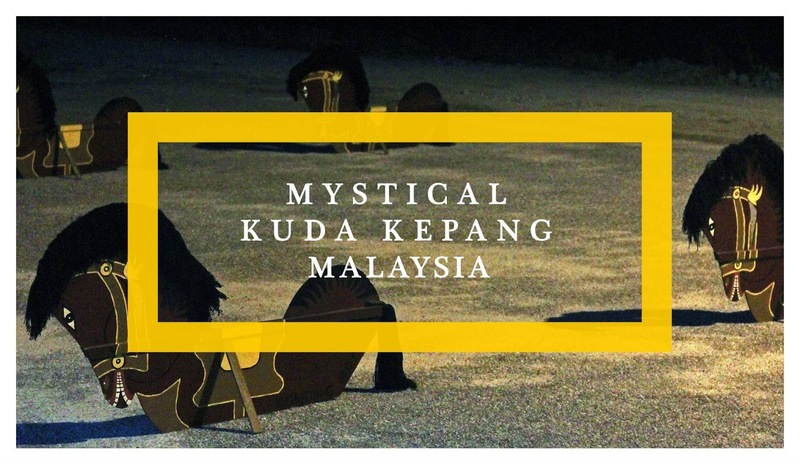 While Kuda Kepang is originally a traditional Indonesian Javanese dance, it has been brought over to some states in Peninsular Malaysia (mostly to Johor and Selangor) by Javanese immigrants who eventually settled down in the country many decades ago. Interestingly, despite having lived here for generations already, they still manage to continue to retain their Javanese culture, traditions and language to this very day. We went to Pekan Sungai Besar, Kuala Selangor, Selangor – where there’s a large population of Javanese - one afternoon to meet up with Wak Rusli, the group leader and shaman of a Kuda Kepang group called 'Persatuan Seni Budaya Warisan Kuda Kepang'. We spent the afternoon at Homestay Sg Haji Dorani - one of the most popular homestays in Malaysia - with Wak Rusli and his group, learning the theories and history behind the dance. We also learnt to dance the mystical dance. Some of us got the chance to learn the traditional dance moves on one-to-one basis whilst still dancing in a troupe as a whole. That’s when I met Muhammad Haris bin Abdul Hadi (photo above), a 15-year old from Kampung Sg Haji Dorani, probably one of the younger ones from among the 4th generation Javanese who continues to keep the tradition of Kuda Kepang alive among the Javanese folks in Selangor specifically, and Malaysia, generally. He was the one with the leading white Kuda Kepang (there are only two white hobbyhorses in the group) in the afternoon “class”. When asked, he told me that he’s been learning and performing Kuda Kepang for some 7, 8 months with the dance troupe. Still relatively new by any standard but his confidence and passion in the tradition certainly showed, just like the rest of the dancers in the troupe. After a beautiful sunset at the village and early dinner, we were ready - albeit some anxious feeling - for the mystical Kuda Kepang dance performance. While the afternoon session with Wak Rusli, Muhammad Haris and the rest of the dancers gave us the chance to learn the subdued version of Kuda Kepang, the evening programme's going to be the “real deal” as they're going to incorporate trances and magic into the dance. Once this was done, a “sajian” (literally means “dishes”) was presented to dewa kayangan. According to Wak Rusli, every single item in the sajian (which includes 7 types of flowers, among others) had been communicated and requested by dewa kayangan and has to be presented before they start their performance. In fact, every single dancer has to perform some incantations over sajian before they could begin with the dance. The whole steps & rituals, right from the moment mantras were cited, were accompanied by gamelan music, performed live by the group percussionists. They started with a slow dance in a circle, with a hobbyhorse close to their body, with rhythm in their feet. Their moves followed the haunting music and were dictated by the whipping of a cemati (whip) onto the courtyard by one of the dancers. It wasn’t long before each and every one of them started to show signs of falling into a trance. A few dancers started to break away from the dance circle to go for the sajian, which had been placed right in front of the gamelan percussionists, not far from some of us spectators. Two or three of them seemed to be like fighting over sajian, although I'm not really sure if they're fighting over food or they just simply couldn’t see eye to eye with each other. Other than “horse riders”, there were also non-horse riders – the mask wearers – that formed part of the dance. They joined the dance a bit later, once the horse riders have started to be in a trance and possibly possessed. Earlier in the afternoon, Wak Rusli had shared with us that it is possible for some of the dancers to get possessed by some spirits. These spirits tend to be animal spirits, like horses, monkeys, snakes, elephants, etc. and that we would notice this in the behaviours of the possessed dancers. This, we sure did and it gave some chilling moments for some of us despite the humid evening. At least two of the dancers simply jumped onto a coconut tree and easily climbed to the top for some coconuts. This caused us, spectators, some concern as the tree is located right behind us and well outside of the “locked” courtyard. Does it mean that some of the spirits have managed to get out of the dance compound? Can they affect and possess any of us? These thoughts ran through my mind and I could see that some of my friends shared the same concern too. From just feeling anxious, we're now starting to get jumpy. We tried to keep a “safe” distance from the (possessed) dancers while at the same time still trying to watch and capture everything on our camera. Another couple of dancers could be seen peeling coconut husks with their very own teeth (and was successful too)! Even Wak Rusli, the leader of the pack (and thus we, or rather I, believed to be invincible), was not spared either that evening. He apparently was possessed by the spirit of an elephant. At one point, he even held and ate some ember using his bare hands - definitely not something that you see every day! The dance went on and on for over 2 long hours. A few dancers somehow managed to remain steadfast with the same dance steps throughout. The rest, however, were "running wild" around the courtyard. Some of us started to wonder if it's ever going to end, what with Wak Rusli being under a spell of some kind. Towards the end, however, Wak Rusli slowly exorcised the dancers one by one, all the 9 horse riders as well as the mask wearers. Earlier I had learnt that during each Kuda Kepang dance performance there would be two shamans involved. I had wondered why but when I saw Wak Rusli got possessed as well, I began to realise that it was for a backup. 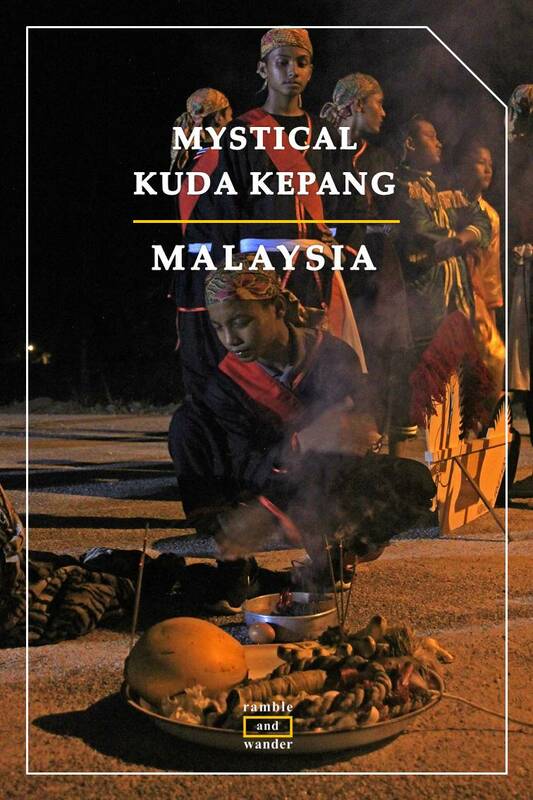 Wak Rusli was exorcised by his own daughter, who had acted as the second shaman. It was well after eleven by then. Every single one of the dancers had been exorcised. I saw Muhammad Haris went to sit by a wall, alone, not far behind me. I had wanted to approach him and ask some questions but then he looked exhausted and a bit lost, like wondering what had actually happened to him in the past 2 hours. As a spectator, to be honest, I’m not really sure if the Kuda Kepang dance performance that we had just watched was for real or was just that, a performance. Some of us are convinced that it’s for real. That the dancers indeed got possessed. A few, however, not so much. As for me, I just can’t decide if it really involved the unseen world, if the dancers were really possessed, or if they were just in a trance. Either way, what a night that was. Watching the real Kuda Kepang dance for the first time sure did give me some chilling moments. Have you ever watched a Kuda Kepang dance performance in person? If you have, what do you think of it? If you haven't, have you watched something similar elsewhere? Some mystical traditional dance, perhaps? What do you think about it? As mentioned earlier, I had the opportunity to watch this Kuda Kepang dance performance during Rentak Selangor 2 programme. The programme was organised by Tourism Selangor, Gaya Travel Magazine and Selangor State Govt. 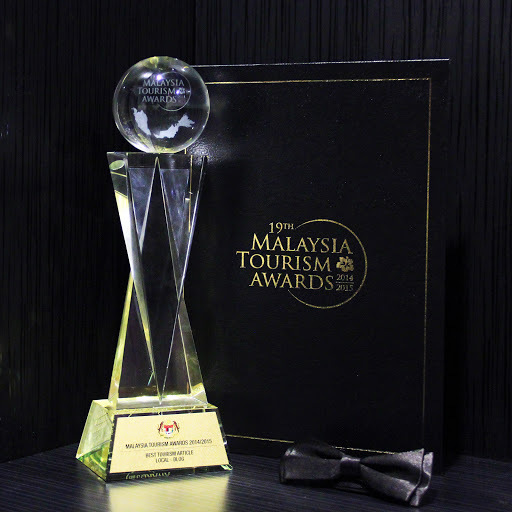 (Selangor Youth Generation Development, Sports, Cultural and Entrepreneurship Development (UPEN)). Thanks, Danik. Kuda Kepang is usually performed during special events only so unless if you happen to see them during a local cultural festival, chances are you'd never hear about it ever, unless if you're really, really into local cultures or have read about it somewhere. Even as a Malaysian, I've seen it performed live just a few times only, and this one was the first time I watched the "real" version of it. I haven't seen this dance before but I work at a boarding school and we have a lot of international students. Each year the students take part in a Cultural Event and they perform songs and dances from their home countries - its always great to watch! Ah-ha! I attended a boarding school as well where there're plenty of international students so I know what you mean. It's really fun to watch and a great way to learn each other's culture. Wow, this reminds me of a similar dance in Indonesia that we saw when we went there. The horse looks the same although Malaysia's had more hair. I'd be interested to watch this in real life as I like learning more about the culture and arts of a country. Ah-ha! Most likely it's the same or something really similar as Kuda Kepang originates from Indonesia and was brought over by the Javanese who migrated to Malaysia decades ago. It is good to see a youngster trying to keep an old dance form alive. I would have loved to see a video of the dance to see how it is done. Yup! It was lovely to see youngsters embracing their tradition & culture to ensure that they continue to exist for generations to come. I would love to see the Kuda Kepang dance! I don't really believe in spirits but it is interesting to see how the locals beliefs shape the culture and tradition. 2 hours is pretty long for a dance! Sounds like a really interesting dance and ritual--would love to see it in person sometime. That's cool that you first heard the song in the 80's and then finally got to see the dance performed live and even learn some of it! What a cool experience! This seems so interesting! I enjoyed reading your post! Your translation is awesome man... rarely do I read translation of such difficulty retain its poetic styling rather than being 'Google translate' in nature.